Tag line: "After a decade of silence...The Bizzz is Back!" Trivia:Jim Siedow is the only actor in this movie that was in the original. Thirteen years after making horror history with The Texas Chainsaw Massacre, director Tobe Hooper returned to the Lone Star State to continue his tale of mayhem and murder. 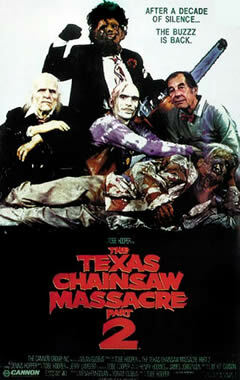 But where the original film chilled me to the bone, The Texas Chainsaw Massacre 2 just left me cold. Hoping to avenge the death of his nephew, Franklin, and the brutal beating of his niece, Sally, Texas Ranger “Lefty” Enright (Dennis Hopper) has spent the better part of 13 years tracking the cannibalistic Sawyer family: Cook (Jim Siedow), Chop Top (Bill Moseley), and Bubba, also known as Leatherface (Bill Johnson). With the trail cold, Enright catches a break when local DJ Vanita Brock (Caroline Williams) receives a disturbing call from two high school students who are being chased by a mysterious pick-up truck. Having caught the entire event on tape (including what sounded like the murder of the 2 teens), Brock takes the recording to Enright, who asks her to play it on the air. Could this turn of events lead to the showdown that Enright has been waiting for? Not all of The Texas Chainsaw Massacre 2 is bad. I liked seeing Jim Siedow reprise his role as the Cook (when we get our first glimpse of him, he's accepting the top prize at a chili cook-off, declaring to the crowd as he spills chili all over his polyester suit that “the secret is in the meat”). and being a Bill Moseley fan, it was nice to see him added to the cast (though, if you're familiar with the original, the very presence of his character defies logic). There's also a very good scene that takes place in a radio station, with an effective “jump scare” thrown in for good measure. Unfortunately, this is where the positives end. Dennis Hopper is an actor I always enjoy watching, but in The Texas Chainsaw Massacre 2, his character is pointless. In one puzzling scene, his "Lefty", bent on revenge, enters a hardware store and purchases 3 chainsaws, which he then takes outside to test, flailing them around like a crazy man. Meant to show how unhinged his character had become, this sequence only manages to bring the entire movie to a grinding halt. Caroline Williams, who takes on the "Damsel in Distress" role, fares a little better than Hopper, but only slightly, and watching Bill Johnson as Leatherface had me longing for Gunner Hanson to return to the role. It's not that Johnson was bad, per se, but his Leatherface was a bit too emotive, a far cry from the “controlled chaos” that Hanson brought to the part. As for the story, I admit I had high hopes once the setting switched to the abandoned amusement park, but the 40-some minutes spent there could have easily been cut in half, with nothing of substance lost. The final nail in the coffin was when the film attempted to repeat history by staging yet another 'dinner sequence', where it appears the only acting instructions that poor Caroline Williams received was to copy Marilyn Burns' screaming fit from the original film. Where I will always hold The Texas Chainsaw Massacre in the highest regard, it's sequel, The Texas Chainsaw Massacre 2, will forever be my 'go-to' film when I argue the point that, occasionally, sequels are a complete waste of time. You have the wrong movie up for the new episode release Doctor, maybe you posted the wrong one. All I can say is the bonus is INCREDIBLE. The best horror episode I have ever heard and I have been listening to horror podcasts for 5 years! TY TY TY for the extra episode, I waited up to hear what the Planet macabre podcast was going to come up with and it was purely outstanding. @D.T.C. - Actually, I had little choice but to post MASSACRE 2, because I had already posted the original film back in September (before Planet Macabre was even in existence)! I have several links to my take on the classic MASSACRE within the review above. And thanks so much for your thoughts on the bonus episode. I are truly humbled by your kind words. Thanks for listening! @Anonymous: Thanks so much. I'm glad you enjoyed the bonus episode (and I think all the guests we had on went a long way in making it so special. Each and every one of them were superb). Thanks for listening! The breaking down of all the categories of movie making was really neat and liked that aspect a lot. All of the hosts were super. A great gang of horror aficienados. A real pleasure listening to all the details, I can't until the next bonus!!!!! @Iphelia: So glad you enjoyed the show, and I couldn't agree with you more. Everyone had some great insights into this classic film. Thanks for the kind words, and for listening. @Blake: The guests were, as you said, super, and I'm happy you enjoyed it. Billchete did an awesome job putting this together, and his hard work sure paid off in a big way! Thanks for the comments, and for listening. it's because of the awesome support of the fans that we wanted to put this show out in the first place. It is truly appreciated. comments rolling in already i see dr. shock. i figured i would come over here and check out your horror blog instead of emailing everyone individually. the texas chainsaw power-show i like to call it was incredible. i don't think any horror podcast has ever covered a single movie in such fine detail be4. this was top-tiered and can't wait for more on this line. i am buying the blu-ray tomorrow after work. ty also for the extra show, i know i for one appreciate it very much. my wife is looking forward to the "evil puppets" show, she had been wanting me to write-in about asking about doing a show on dolls, puppets and clowns and wouldnt you know you are covering it. @Vic: Thanks for stopping by. I know I speak for everyone when I say we truly appreciate your kind words. I'm happy you enjoyed the show, and all the credit must go to Billchete, who not only planned out the episode, but also assembled the incredible line-up of guests. And trust me when I tell you you'll LOVE the Blu-Ray! It's one of my favorites in my collection, and you won't want to miss ANY of the special features. You'll have a blast with it. And please let your wife know she can thank Lady Phantom for the upcoming Doll show..this was her theme! I'm looking forward to it myself, and am sure it'll be another fine episode. Thanks so much for the comment, and for your continued support of Planet Macabre. And yes, definitely run out and get a copy of TEXAS CHAINSAW MASSACRE. It's a truly great movie (with a pretty bad sequel, unfortunately). @Zain: Thanks for stopping by, and thanks also for the kind words about the newest episode. This show wouldn't have existed without fans such as yourself, so you all deserve as much of the credit for it as we hosts. Hi Doctor I am one of your fans of the Macabre podcast who was craving for more and the bonus was an all out fantastic show. Thank you for that and all the guests. What a discussion, fantastic again. The time line scene talk was brilliant. I loved how everyone was enthused with the talk even when they had faults with certain scenes. I missed your Chills DVD Doctor Shock so I am waiting on no.11 for a new classic. @Anonymous: Thanks so much for the kind words, and for listening. I'm glad you enjoyed the bonus episode. @Jeannot: Thanks so much, and I definitely agree: I feel all the guests did a fantastic job covering this film (and don't worry...I'll have a new CHILLS pick one week from today!). Thanks for listening. Impressive bonus episode, not only was it extremely informative, but you all had me laughing through out the episode. Thank you for providing the extra episode to us loving horror fans. We at Planet Macabre definitely appreciate the support of our listeners, and it was because of this support that we put out the bonus episode. The real thanks belongs to all you fans. I saw this one at the tender age of 14, before I saw the original. It doesn't hold a candle to the first TCM, but I think on its own merits it's a good and extremely brutal black comedy. @Glitter: Thanks for the comment! I can see where you're coming from, and your opinion is shared by a good many people. I suppose my view of this film is somewhat muddied by the fact I am SUCH a fan of the original (my favorite horror film of all time), and I didn't really get into the way it relied on humor to continue the story. It just wasn't for me. Thanks again for the comment, and for stopping by.